Grey's Anatomy has had a lasting impact on fans over the last 13 years, and Thursday's episode was particularly emotional. The episode, titled "Flowers Grow Out of My Grave," brought back several deceased cast members that we haven't seen in years. More: Here's Why Kim Raver Says Teddy's Grey's Anatomy Season 15 Storyline Is "Tumultuous"
The reveal happened in the final moments of the episode, while Meredith Grey (Ellen Pompeo) was walking through the halls of Grey Sloan Memorial. At first glance, it seemed like any other night; however, Meredith was soon greeted by close family members and friends including George O'Malley (T.R. Knight), Mark Sloan (Eric Dane), Lexie (Chyler Leigh), Ellis Grey (Kate Burton) and even Doc, Meredith's dog. But that's not all. Derek Shepherd (Patrick Dempsey) — who died after a horrific accident in season 11 and was Meredith's husband — also made an appearance. Of course, many fans were shocked by the scene, but Grey's Anatomy producer and writer Krista Vernoff told Entertainment Tonight that the encounter has been in the works for some time. "We’ve been talking about that sequence since the writers’ room gathered in July," Vernoff said. "We’ve been working on that sequence in some way or another for many months. We talked a lot about who would ultimately be included. Where we landed, it felt like the significant deaths of Meredith’s family and close friends and her dog, and so that was who we included there." There was one notable omission, however: Denny Duquette (Jeffrey Dean Morgan), a fan favorite from seasons two and three. When asked about this, Vernoff said they considered including Denny but ultimately decided against it. "There was a version where we included Denny Duquette… [and] there was a version where we included Kyle Chandler, the bomb squad guy [who died in season three]. These were pivotal deaths in Meredith’s life," Vernoff told ET. However, "it didn’t feel to me when I watched it that those characters would be visiting Meredith. I believed that they would be visiting their own families." The episode was intentionally timed to coincide with Día de los Muertos, or Day of the Dead, a multi-day Mexican holiday in which family and friends pray for (and remember) their deceased loved ones. 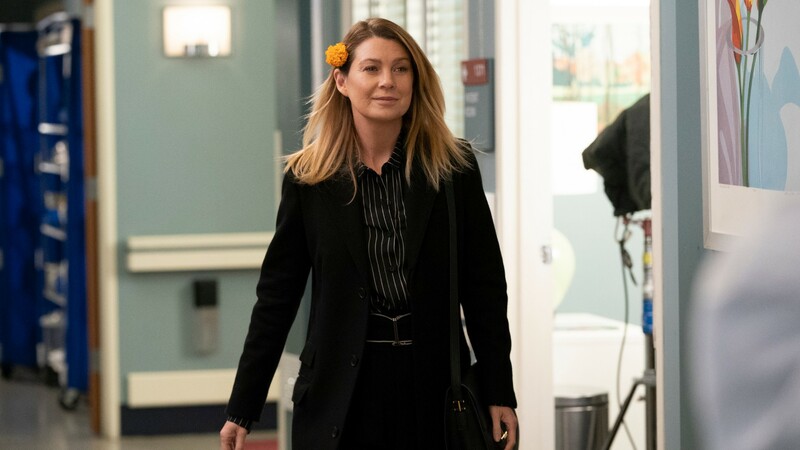 Eagle-eyed fans likely would have noted that Grey's was making the connection as Meredith wore a marigold, the flower most associated with the holiday, tucked behind her ear. "Day of the Dead is a holiday that is about celebrating and inviting back for a visit those who we’ve loved and lost," Vernoff said. "The episode aired on Day of the Dead, and we did a Day of the Dead theme for the whole episode. It felt like perfect to me as an opportunity to have dead people and her dead dog visit Meredith." And while this scene may have been a bit unconventional, it was nice to see Grey's take viewers down memory lane and give some comfort to Meredith, who has undergone her share of tough personal losses in recent seasons.